Since we discovered Theme X we have used it on a lot of websites, it is fully customisable and any look and feel can be achieved by using this theme to develop your WordPress website. 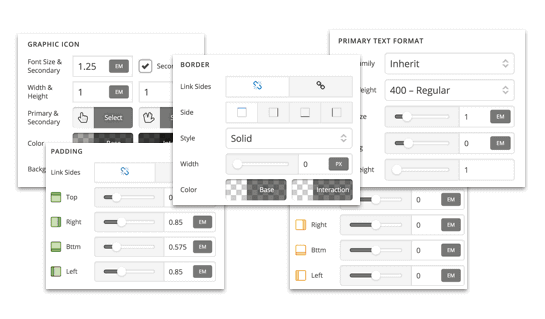 Theme X does support and includes Visual Composer but it also feature their own page builder called Cornerstone. Theme X comes bundled with a total of 29 extensions, these plugins that can be used to add more functionality to your website. Theme X’s theme customisations panel. Customisations – Site wide customisations appear in a live preview as you make changes, once you are happy with customisations, you can simply save to make the changes live. This does save a lot of time refreshing your pages to see changes. Cornerstone Page Editor – Cornerstone is a bit more complex than Visual Composer and although this gives you a lot of control over each element on the page some of our less advanced users finds this not easy to use. Support – Theme X offers a forum where clients can log in to get help. Support is relatively fast to respond but in most cases you don’t need to submit support as the question is probably been dealt with in the forums before.